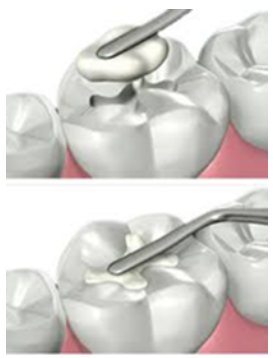 At BajaDent Tijuana, our specialists use composite fillings made of white resin. The resin is whitened so it would match your natural teeth color, and also hardened with an ultraviolet lamp, in order to blend in with your natural teeth. In fact, the resin will match your natural teeth color when applied to that degree that it won’t be visible. In earlier days, doctors used to fill tooth cavities with different mixtures of metals, amongst them silver and mercury. So, when a person laughed, it was pretty usual to spot dark or gray fillings in their mouth. This caused people to feel insecure because it was very easy to identify those who had suffered from tooth decay and this was automatically related to dirt because it was known that what caused them was poor dental hygiene. This caused people to have low self-esteem and try to hide their teeth, covering their mouths while laughing or avoiding doing so. But now, thanks to the advances in dentistry it is no longer necessary for you to suffer this, now nobody has to know that you have suffered from cavities, because you can use White fillings in Tijuana, which will look very natural. What type of fillings experts us in our Tijuana dental office? • To safely remove mercury/amalgam fillings, we also follow appropriate protocols. 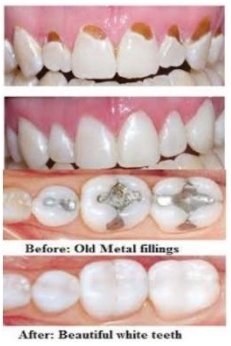 One of the best advantages of white fillings is that they do not contain any metal. In fact, some countries decide to no longer use mercury-containing filling, because studies have suggested that mercury used in amalgam fillings can pose a threat to your health, although this is not conclusive. Another advantage of white composite fillings is that requires very little of the tooth structure to be removed for placement which means more of your natural tooth will be preserved. Since the filling bonds with the actual tooth offer additional stability for a tooth that has already been weakened by decay or breakage. White fillings are not affected by any changes in temperature, unlike amalgam fillings which tend to contract and expand, this is a great advantage because protects the teeth from a fracture. This is the biggest advantage. White composite fillings can look just like your natural teeth, unlike silver-colored fillings, because the color is carefully blended for a seamless finish. This makes them the best choice all of the teeth, but especially for front teeth which look very unattractive with silver fillings. Baja dental Solutions offers you solutions for dental health that are both strong and aesthetically appealing! Bonded fillings are needed in case of dental damage such as cavities, chipped teeth, gaps between teeth and even to replace old fillings. At Baja Dental Solutions we provide tooth-colored composite restorations. You can receive your own tooth-colored composite restoration in as little as one sitting. Amalgam-free dentistry is the approach that we have adopted at Baja Dental Solutions for a beautiful, healthier world. The cost of fillings at Baja Dental Solutions range between $55 and $90 each, the price depends on their size.